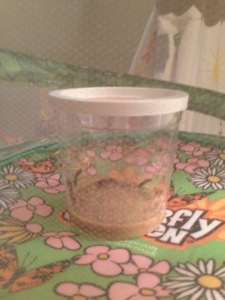 We got back from nearly 2 weeks in England yesterday to find our caterpillars had arrived in the post. My Mum had given the girls a butterfly garden for Christmas and we had waited until the weather was warm enough outside before we ordered the caterpillars. The girls were very excited. The caterpillars were examined (from outside their little pot – the Little One was all for taking the lid off to touch/poke them all!) and we placed the little plastic pot with the 6 caterpillars in the butterfly garden to help keep inquisitive little fingers away from them. 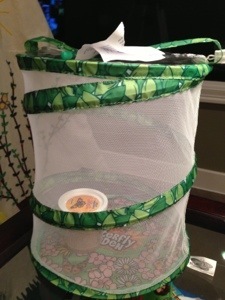 The caterpillars are a bit docile but according to the instructions this is entirely normal and they will become more active as they get bigger. Overnight 5 caterpillars have moved around but I’m slightly worried for caterpillar number 6 who is in the exact same place as he was when he arrived. Luckily the caterpillars haven’t been given names yet, but I guess a dead caterpillar is all part of the experience! Stay tuned for more caterpillar updates!